EAST SIDE (only) of Oceanfront duplex. Sleeps 18. 6BR, 4.5BA. One of the six bedrooms, which has a sleeper sofa can be used either as a bedroom or a TV room, . 2 Large Screen "Smart" HDTV's with Netflix/Hulu available with your username and password, 1 TV has Roku. Two other flat screen TV's w/ cable. Wireless internet access offered for your convenience. Fully equipped kitchen with dishwasher, microwave, washer/dryer. 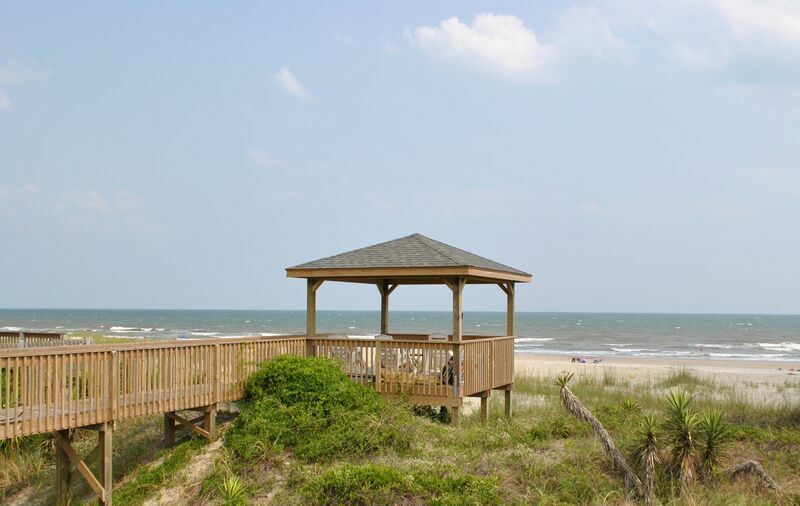 Outside enjoy 2 outside showers, private sundeck on the sand dunes, new gazebo,porch rockers, Non-smoking, no pets allowed. Accommodates 18. Bedding configuration: 1st Flr: King * 2 Doubles * 2nd Flr: 2 Doubles * 2 Doubles * King *Full Sleeper sofa.